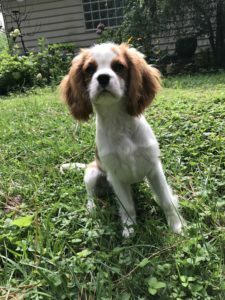 Kirby is a 5-month old puppy who has Severe Pulmonic Stenosis. As a result of this congenital condition, his pulmonary valve is narrowed and restricting blood flow in his heart. Kirby currently has a grade 5 heart murmur and extremely high pressures in his heart. Since his case is severe, Kirby needs a balloon valvuloplasty to allow him a chance at a normal life. The estimated cost for his surgery is $3200-$4500, and he will need at least two follow-up cardiac workups (consult, echocardiogram, and CBC at $750 each). We are working to get Kirby scheduled into surgery, as the sooner this procedure is done, the less damage there is to his heart. If you can help us by contributing to his surgical fund, please visit http://CavalierAlliance.org/donate or send via paypal (friends and family option) to CavalierHelp@CavalierAlliance.org. If you would like to get more involved in fundraising for Kirby, or any of the pups in our program, pleasegive our office a call at 978-254-1005. There are many ways to help including Paint Nights, other local fundraisers, auction donations, iGive for shopping, to name a few. Auction details will be posted on Facebook.com/CavalierAllianceFundraising. No contribution is too small and we greatly appreciate all of your support!